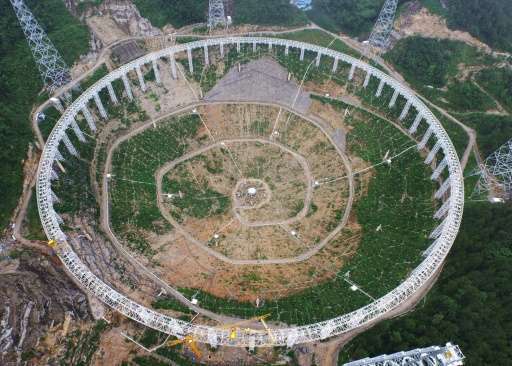 Just standing there between the mountains, the 500 Meter Spherical Telescope is breathtakingly magnificent -- a stupendous architectural design -- even if it never works. Just curious. Why do you think it will never work? I wonder what sort of transmitter facility it would take at Proxima Centari to be picked up by FAST. 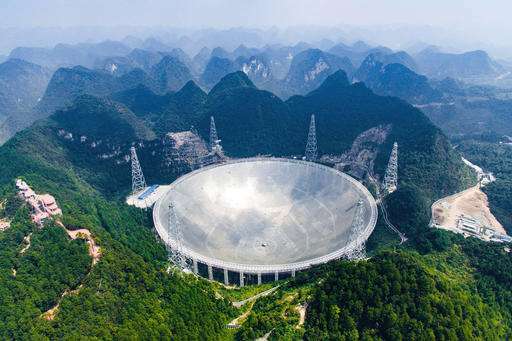 How can a radio telescope work when the dish is made of thin separated wires rather than a solid dish? Don't you miss all the signals that arrive between the wires? As long as the wire mesh has a separation significantly less than the wavelength of the radiation you are trying to detect, it is almost as efficient as a solid dish but significantly lighter. How can a radio telescope work when the dish is made of thin separated wires rather than a solid dish? Don't you miss all the signals that arrive between the wires? This is the type of question that somebody asks himself and then does a quick search on the internet and finds out. But then there are those who come here and ask, expecting people to do their research for them. And there are others who seem to enjoy feeding these people for unknown reasons. Notice how I avoided using terms like lazy and mental paraplegics and suckers and dupes and etc? People dont seem to like those terms.